Duo made his first appearance in 1996 with the arcade title Rockman 2: The Power Fighters, in which he acted as a sort of promotional teaser for Rockman 8‘s release later that year. He was touted as a mysterious new character who was stylistically quite unlike most of the other characters in the Rockman universe, and yet was somehow connected to Rockman and his friends in the past. 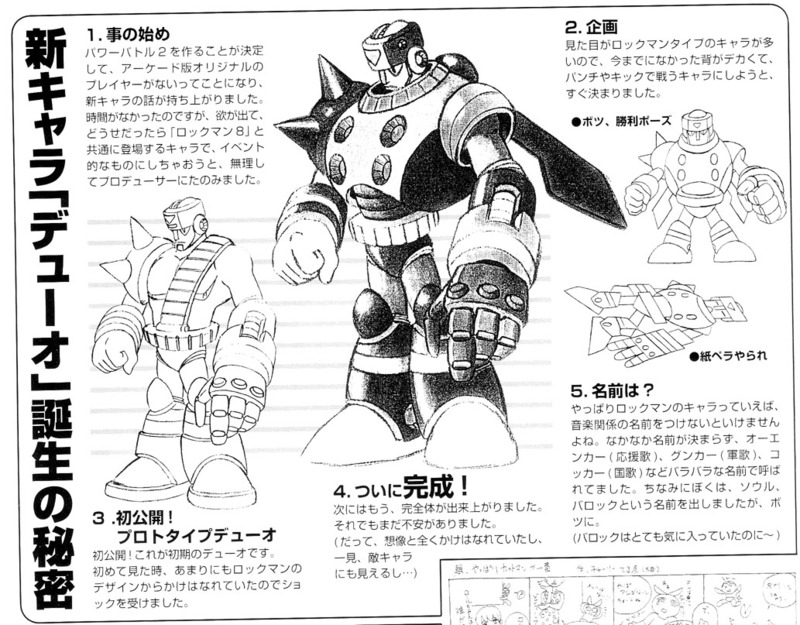 The Capcom Secret File “Grand Rockman Exposition ’96” was one of the first to explain how Duo came to be–not the character’s back story, but the ideas and influences that went into shaping the character itself. Because we didn’t want to just throw in another Rockman-type character, it was decided to make a character that was massively tall and would fight with punches and kicks, to make him stand out from the kind of characters that appeared up till now. It’s never been shown before! This is the early draft of Duo. 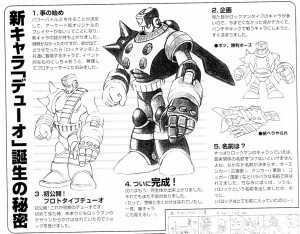 The first time I saw it, I met with quite a shock at how much this differed from traditional Rockman design. 5. So what do we call him? 2 Comments to "The Birth of Duo"
Yeah, Fighting Street's had the secret files up and scanned for years, and I'm sure Mega Man sites have had pages up too. I probably should have mentioned that if anyone wanted to look at the whole thing.